Aesthetic Victorian gold brooch pendant with angels head and diamond: Description by Adin Antique Jewelry. 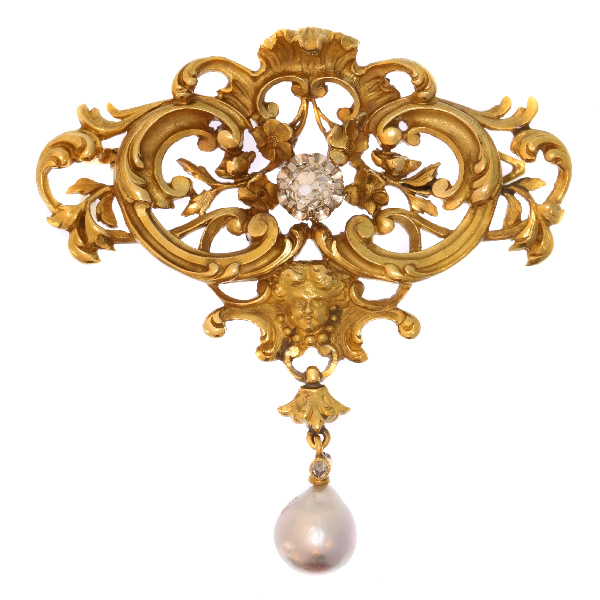 Let this 18K yellow gold French Victorian brooch flood your senses with its harmonious neo-Rococo openwork interplay of rocailles and flowers. As two blossoming branches sprout from the top shell, a wave of curly C-shapes and swirly S-shapes ripples into a refined background flower frame arrangement. In the meantime on the bottom of the brooch, an angel's head serves as the pillar for the tips of two C-elements across the draping leafs as they lift an old European diamond up to the piece its center. And lastly, the estuary of this abundant cascade of elegance narrows from the angel's collar into a dangling drop shaped saltwater pearl. How can one not adore this eclecticism of the late Victorian period as it unites the land with the sea and the heavens - flowers with shells and angels - Belle Époque with neo-Rococo and neo-Classicism. Style specifics: The Late or Aesthetic Victorian Period - Experts divide the reign of Queen Victoria, also called The Victorian era (1837-1901) into three periods of about twenty years each; The Romantic Victorian Period (1837 - 1860), The Grand Victorian Period (1860 - 1880), and the Late or Aesthetic Victorian Period (1880 - 1901). We consider this to be of The Late or Aesthetic Victorian Period. Jewelry of this period is changing back from heavy to more smaller, romantic pieces with often whimsical motifs. Jewelers using diamonds and bright gemstones in elaborated and fine feminine pieces. Diamond(s): One old European cut diamond with an estimated weight of ± 0.40ct. (colour and clarity: M, vs/si). One senaille . A senaille is a simplified rose cut diamond, a small diamond chip with perhaps a few polished facets. We do not have the weight of this diamond which is normal in our trade when it comes to senailles.